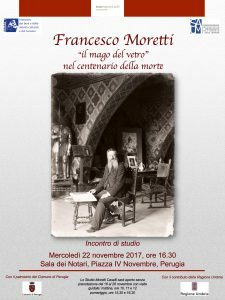 On Wednesday 22 November 2017 at 16:30 in the “Sala dei Notari” – Perugia a convention was held to celebrate Francesco Moretti in the hundredth anniversary of his death. 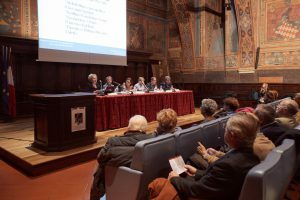 The lecturers Fedora Boco, Vittoria Gaibaldi, Mario Squadroni, Anna Matilde Falsettini and Giorgio Panduri spoke about his innovative work as master glass painter, about his activity at the Academy of Fine Arts as a teacher and principal, about his direction for over forty years of the Municipal Art Gallery (now National Gallery) and about his taking part, as an expert of art, in various committees, among which the Committee for Artistic Heritage. 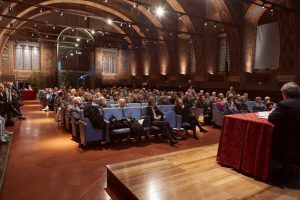 The Sala dei Notari filled up with public of all ages.